What better way to show your CRUSADER spirit than learning the cheers yourself! The following is some helpful information for you and your camper! Students will be dismissed by their teacher and escorted by the cheerleaders and cheer moms to the cafeteria for a quick snack provided by the cheerleaders. Once all campers have arrived, we will head to the gym! Please have your carpool tag ready and pick up your camper at 5:00 from the gym. We will dismiss in carpool line with the coaches and cheer moms helping load the campers. 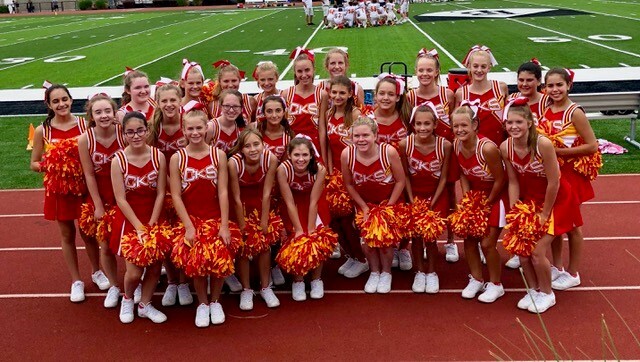 All students who attend the Spirit Camp on Wednesday, October 17th will be performing their cheer at the Homecoming Pep Rally on Friday, October 19th and at the Homecoming Varsity Football Game on Sunday, October 21nd. Please join your camper at the Homecoming Pep Rally to watch them perform their cheer for the school. Please have them wear their spirit camp shirt for their spirit wear today, so that they can look sharp for their pep rally performance! Campers need to meet the Cheerleaders at the Gym, 5 minutes prior to the end of the 1st half of the Varsity game. Please arrive at 2:15 pm. Please have your camper wear the spirit camp shirt, which they will receive at camp, and a pair of comfortable shorts, tennis shoes, and their hair up in a ponytail! We look forward to spreading the Crusader spirit with your camper!